Following Tony Vincent's lead, I decided to share my most interesting purchases of 2009. This netbook was one of the first to have n networking, a 6-cell battery, and Bluetooth. I purchased the pink Valentine's edition with Windows XPH, and, later in the year, turned it into a netbook running another popular operating system! This digital camera has a great lens, a 24-240mm optical zoom lens, and was very reasonably priced as the HZ15W was released. Oftentimes, I wait until new models that are not so very different to come out, and pick up the current model at a substantial savings. I loved my first Kindle, and really love the new Kindle 2! Electronic books are wonderful, and the Kindle is easy on the eyes, easy to operate, and fun to use! This leather laptop case is pricey, but I managed to find one in the vintage brown on eBay for very cheaply. I only take it out when the weather is nice, but it is beautiful! Since we basically have the house o'Macs now, and n networking on everything, I opted to get the AirPort Extreme for the head of the network. However, our weather station server only has g networking and it co-exists quite nicely because of the dual band. It has worked flawlessly and has the added bonus of letting me access items stored on the data side when I am on the road. I purchased three of these over the course of the year. The first two were purchased to extend the AirPort Extreme network to various areas of the house, which allowed me to roam far into the yard to work this past summer! The third one was purchased to carry with me on the road to allow, in some conference situations and hotel rooms, the ability to both be wireless and also allow others to share the connection. The Slingbox is one very cool invention. It attaches between your DVR and your wireless network to allow you to access, via a client on a computer or the iPhone, your DVR at home from wherever you are! You can watch live TV or your saved Days of Our Lives recordings (or any recording on the DVR). There is no monthly subscription charge or anything and it works like a charm! This little speaker is small and light, but produces a large sound. It works well in a classroom setting or a presentation room with about 75 chairs. The audio cable is rather short, so it has to sit next to your computer, but it is a great addition to your tech toolbox! This little adapter allows most Firewire iPod accessories to work with the newer USB-based devices like the iPod nano 4G, iPod touch 2G, and the iPhone 3G/3GS. This little adapter was the lifesaver to allow the Firewire iPod connection in my new Nissan Cube to work with my iPhone 3GS. The iPod part of the phone is controllable directly from the radio now! I know that others have had luck with older iHome radios and such working with their new devices with the addtion of the passPort charging adapter. This SD card automatically uploads, while the card is still in your camera or camcorder, your photos or videos to your favorite photo-sharing, social networking, or blog site when you are in a wireless environment. I found it a bit disconcerting to automatically send everything as it is taken, so now chose to manually send only the things I want to be shown online. What can I say? Best. Piece. of. Hardware. Ever. I love the backlit keyboard, the SD slot, and everything about this laptop. I received it before Snow Leopard and Windows 7 were out, but upgraded immediately to both new operating systems and iLife 09 as soon as the all became available. I run Windows under Bootcamp, since I need to have access to all the processing power and RAM for some of the graphics and video-intensive apps I run on the Windows side. The link leads to the newer model of the one that I have, but this drive is rock solid for backup use on the Mac in conjunction with Time Machine. I was very excited when the Wacom Bamboo Touch was released. I purchased it right away to see if I could replace my trackballs with it, and use it as an external touchpad on my computers. I also wanted to experiment with some of the neat features it added on both the Mac and Windows sides of my machine. It was not as smooth to use as I hoped it would be, so I wound up returning it. Soon after, the Bamboo Pen and Touch Tablet was released, and, since I already had a Wacom pen tablet, I did not purchase that one. I cannot speak to how well it works, but, it is really useful to have a small pen-based tablet available and, with the added bonus of touch, it probably would meet the needs of most occasional users. And Wacom products are well-made and often come bundled with some very useful software. This model is still available new, but is at a very nice price point right now. If you have never had a Dymo Label Writer, you would be impressed with the speed, the ease of use, and the ability to print stamps and labels effortlessly. This model takes two types of tapes, so is extra useful! With the release of the new version of this "desktop appliance", I took the plunge and purchased it. With over 1500 widgets to install, the inclusion of a faster processor, FM radio, streaming radio, and a simple network set-up, this little device is fun to have around! I wrote a blog post about my first impressions. I was sold on the Cocoon Innovation products as soon as I saw their GRID-IT! organizers, which are sold separately and also come with the laptop cases. I purchased the hard-sided case, and, even though it is intended for a 15.4" laptop, the 13.3" MBP is held sturdily and the power cords fit nicely next to it. The GRID-IT! panel holds all the accessories for the laptop and is just so organized! I did a lot of research before deciding what HD camcorder to purchase. I wanted one with flash internal memory (this one has 32gb) and it also has the ability to also hold up to a 32gb SD card, too. The features on this camera are varied, well-thought out, and it is fun to use. It is easy to get the video off of the camera and onto the computer for editing. We are not huge movie-watchers in our house, but, with the ability to stream over 17,000 Netflix titles to one's computer, with the one-DVD at a time, unlimited account, I took the plunge. In addition, I am waiting patiently for my Samsung Blu-ray BD-P3600 player to arrive, since it streams Netflix right to the television! The Samsung comes with built-in wireless (and wired) access and also streams Pandora Radio and YouTube. Of course, it also plays DVDs and Blu-ray disks. Well, the year is almost over, so this list is probably complete. I am looking forward next year to the possibility of an Apple Tablet of some sort as an bridge device between the iPhone and the laptop. Time will tell! Please feel free to share your opinions on any of these devices or share your favorite purchases of 2009. 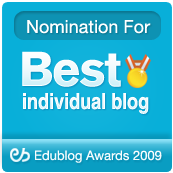 Edublog Awards - 1st Runner Up! Thank you to all who supported me and voted in the Edublog Awards "Best Individual Blog" category! I came in second, which is amazing, and I am so honored and feel so lucky! Apparently it was a close race among the top three and the tallied numbers will be posted on their site soon. Thanks muchly to Steve Hargadon and Sue Waters who work so hard on this yearly program of bringing exciting new edubloggers to the attention of educators. And, of course, with social networking tools, you can follow some of the nominees, and then follow the blogs they follow, and on, and on, and on! This blog, Kathy Schrock's Kaffeeklatsch, was recently nominated for an Edublog Award for 2009 in the category of "Best Individual EduBlog." I was so excited and honored, since this was the first time my blog has been nominated in this competition! I just finished looking through all of the other blogs nominated in the same category, and found some gems that I did not know about! I will be adding some of them to my blog page where many teachers start when trying to find some good stuff. Every blog I looked at deserved to win, so please cast your vote for your favorite by December 16th! Want 25 green screens in your computer lab? Thanks to Tom Barrett for publicizing, on Twitter, the TeachMeet09 Ed Tech Roundup. I happened to catch one tweet and watched a two-minute tutorial about greenscreening and iMovie 2009 by Kevin McLaughlin. It was so easy, once the advanced tools were turned on! I started thinking about the use of this in our technology classes, and suddenly realized that one could put a green background (#00FF00) as one of the user-created backgrounds in PhotoBooth on the Mac, record the greenscreen video, and then use Kevin's tip for using that in iMovie. This way, each student has their own green screen! 1. Import a 500x500 green (color #00FF00) solid color JPEG as the background in one of the effects boxes in PhotoBooth. 2. Record the video in front of this green background. 3. Save the MOV file. 4. Import the PhotoBooth MOV file into iMovie. 5. Import the background video into iMovie. Here is my feeble attempt to show you a quick finished product following the above steps. I just returned from a technology conference that was chock full of presentations dealing with the effective use of Web 2.0 tools. I have presented a lot, and know the pitfalls of presenting in a venue that is unfamiliar to you. Will the bandwidth be sufficient? Will the projector work with my laptop? Will the sound be loud enough? Will the site I am about to demo be available? Will the site I am about to demo be accessible through the content filter at the conference venue? Of course, I am always over-prepared for any emergency. I have the presentation on my computer, on a Flash drive, on a CD-R, in the cloud, in SlideShare, in Adobe Connect and even on paper. This works for a static presentation, but would not work well for an online application presentation. My suggestion, for demonstration of Web 2.0 tools, to create a screencast of the things you want to show ahead of time and carry that along with you. It is better than simply static screenshots, and can get you through the time when the tech support team is frantically trying to get the Internet back up! Screencasts that you can carry with you can be created with Adobe Captivate or Techsmith's Jing Pro. I wanted to share the way I would prepare if I were planning a presentation about a site such as Glogster. I would first screencast myself creating the Glog, step-by-step, so the audience would understand how it works. And, if it were simply a Glog with images and text, I would screenshot the final product to show. A Glog shows up rather large on the computer screen, so you probably would have to make two screenshots and then stitch them together in an image-editing program such as Adobe Photoshop Elements. The other alternative, to avoid the stitching component, is to chose to embed the Glog on a blog or Google Doc, and change the dimensions in the embed code so you can see the entire Glog on your screen and simply create a single scereenshot. However, if you create a Glogster project that includes videos, there is another easy solution I have discovered that will give your audience as close to a real-live experience as possible. Here is a link to my original Glog and the one I am going to create a local copy of. 1. Create the screenshot of your Glog and have it saved as an image on your local hard drive. 2. Gather two original video files you uploaded to Glogster and have them available on your local hard drive, too. 3. Open Adobe Premiere Elements. 4. Place the screenshot JPEG on the Video 1 timeline. The default length will be 5 seconds, but you can stretch it wider. 5. Place one video on the Video 2 timeline and one on the Video 3 Timeline. 6. Drag the video on the Video 3 timeline to the right so it begins at the end of video on the Video 2 timeline. 7. Stretch the JPEG on the Video 1 timeline to match the end of the video on the Video 3 timeline. It will now stretch from the beginning to the end of the project. 8. When you move the playbar over each clip, the clip shows up large on top of the background JPEG in the preview window. Simply grab the handles of the clip, resize it, and place it on top of its static counterpart on the background JPEG. 9. Once you are done with placing both videos onto the background, export your project as a movie and show this movie when demonstrating your Glog. The videos will start automatically in your movie, but your audience will get a real flavor for your multimedia Glog! Here is the finished product that can live on your hard drive. There are other options for creating "back-up" versions of your Glog, too, working on the same principle of placing the multimedia elements over the static background image. One can do this in a single slide in PowerPoint by rotating the slide to the portrait mode, putting the screenshot Glog as the background, and placing your local copy of the videos over this background and re-sizing and rotating them as needed. The advantage of using PowerPoint for your demo version is that you would be able to start and stop both the audio and video when you wanted to. Don't forget you would have to make sure your local videos traveled with the PowerPoint slide, since they are not embedded, but just referenced. However, I love the multiple lines of video feature in Adobe Premiere Elements. I use it a lot for things like having videos show up in the background graphic of a vintage television set or having a moving image in a picture frame within another video. I just received my Chumby One yesterday and all that you hear is true-- you cannot help but love the little information device! After setting up Chumby on your wireless (or wired) network, you simply visit the Chumby site to both activate your device and to choose from the list of applications to install. The adding of applications to the Chumby takes place via your Chumby's personal page on the Web site. Here you add and customize (if necessary) the widgets. It could not be any simpler! The applications cycle through, each staying on the screen for the time you have determined in the set-up. There is also a large button to push that both allows you to pick a certain widget to show, but also allows it to stay on-screen if you wish. Some of the widgets are interactive, like the Twitter widget which allows you to tweet using an on-screen keyboard and the sticky-note app which allows you to leave notes to yourself. You select items from the screen using the tip of your finger or your fingernail (or a stylus), and it works easily. In addition to the 1500+ widgets you can install, the Chumby also allows you to choose from a list of streaming radio stations and podcasts that can even play in the background as your widgets cycle by. Of course, there are lots of clocks to select from, and there is a nighttime setting that dims the screen or even shuts it completely off if you want. If you want to see how to set it up and how it all works, simply visit their FAQ page. I wanted to gather some information from our grade 6-12 students to help me better support them in their use of technology both at school and at home. I sent the 1500 middle and high school students the survey as a Google Form in their Google Apps email account. The survey was open for two weeks and I received 98 responses. I did not do anything additional to convince students to complete the survey, so I was happy with the number of responses I received. I appreciate the students taking the time to respond! The last question gave the students the chance to comment when I asked "Anything you would like to tell me about your personal use of technology?" Here are some of the responses. "I think it would be great to have WiFi all over the school for students to use. I often find myself at school and needing WiFi, especially being part of the theatre program and having long rehearsals when the library is closed. It would make doing online research and such during these times much easier." "In school I do school related stuff on the school computers. Also at home I use my computer to IM (AIM) friends, update my MySpace, or check homework and grades daily." "I use technology for mostly browsing, typing papers and research. Other than that, I use it only for Facebook and playing music. :)"
"I am a frequent Facebook user and if the high school were to go wireless with an assumption of the student body having access to it, Facebook wouldn't be as important to us since Nauset students are at school with you and non-Nauset students don't have access to the Web during the day." Your comments or thoughts on the collected information? I just downloaded the 30-day trial of Camtasia for Mac and am quite excited! Of course, most people think of Camtasia as a screen-capture tool for creating tutorials and such, which it does very well in this version, too. (It only captures full-screen, but it is very easy to crop to the selection you want later.) Here is a chart of the comparisons between this first version of Camtasia for Mac 1.0 and the Camtasia Studio for Windows 6.x product. Only having spent a little time with it, my first impression is that, as well as an easy tool to create tutorials and screen captures (including video and sounds), Camtasia for Mac is a fairly full-featured video editing program that is also quite intuitive! You can import images and layer videos on top of them, layer videos on top of videos, easily separate audio and video lines, apply effects such as one similar to the Ken Burn's effect to videos after the fact, and much more! The share menu item allows you to share to Screencast, YouTube, or iTunes, and the advanced export function allows exporting to AVI, QT, MPEG-4, and more, with the ability to pick your codec and quality options. The TechSmith Web site has a great set of tutorials located here if you want to get a feel for the options it offers. I might have found an easy-to-use tool that allows me to both create tutorials and access to a simple, but effective, video editing program! If you try it out, leave me a comment and let me know what you think! Based on a post last Thursday by a user who was able to find the new Wacom Bamboo Touch Tablet (Model: CTT-460) at his local Best Buy, I took a chance and visited my local store. There was no sign of it with the other Wacom tablets, but I asked a friendly salesperson who looked it up on the computer, and said they seemed to have one in stock. He went to the storeroom, but came out and said it was on the "new items" end-cap, which, in my store, was kind of out of the way. In any case, the one was there, and I scored! (I guess I might have given him the only hug he will get all day!) It is not yet on the Wacom site or the Best Buy site, but it is really out! The Wacom Bamboo Touch Tablet is a USB tablet that can act as a mouse, a multitouch trackpad, and a small drawing tablet. I installed it on both a Macintosh (Snow Leopard on an iMac) and a Windows machine (Toshiba laptop with Vista Home Basic). The Bamboo touch is 8" x 5.5" in size and the input area is 5.5" x 3.25", with the four "ExpressKey" buttons located outside of the input area. These ExpressKeys are configurable for various functions as most input device buttons are. You simply start the software install, pick right- or left-hand orientation, and then plug in the Bamboo Touch to complete the installation. It shows up, after the install, in the System Preferences and Control Panel panes as "Bamboo" and you can set the pointer speed, double-tap speed, etc. There is a nice tutorial on the CD which illustrates and explains all the multi-touch features. The full user guide is also downloaded to your computer in PDF format. Here are a few screenshots from the manual, illustrating the capabilities of the Bamboo. (Click on the thumbnail to enlarge it. Let me start out by saying I am not a mouse user-- I use a trackball on my desktops and the built-in trackpad on the laptops. I also do not take advantage of all the whiz-bang features of the MacbookPro multitouch trackpad on a regular basis. However, I did put the Wacom Bamboo Touch Tablet through its paces on both the Apple and the Windows machines, and all of the multitouch features worked great! I also opened Adobe Photoshop and used the Bamboo touch both as a mouse and as a drawing tool. I could navigate and "fingerpaint" with no problem, but I would still choose to use my Wacom Graphire for serious drawing. My finger is not half as steady as my hand with a drawing pen is. I am going to replace my trackball on my iMac at work with the Wacom Bamboo Touch Tablet, locate it in front of the keyboard, and use it as my mouse. As well as adhering to the sound ergonomic principle of having the input device as close as possible to the middle of your body, so there is no stretching going on, I now also will have the multitouch features available on the Mac and Windows side of my desktop! I plan to take advantage of those swiping, panning, rotating, and the other whiz-bang features! I am preparing an introductory Twitter presentation and am using information from a blog post by Charlene Kingston dealing with setting goals for your own use of Twitter. I asked my Twitter PLN to answer a short survey on this topic. I sent the tweet out to my 4625 followers, and some of my followers re-tweeted the request to 4019 of their followers (who may or may not overlap with my followers.) I received 196 responses, many in the first few hours of posting the request on Twitter. I am a K-16 educator or pre-service educator. I use Twitter to find business customers. I use Twitter to send out and share information. I use Twitter to receive information. I have more than one Twitter account so I can keep my personal and professional tweets separate. 8% of the non-K16 educators had separate Twitter accounts for personal and professional use. The goals for the use of Twitter by the non-K16 educators are illustrated in the graph below. The goals for the use of Twitter by the K-16 educators are illustrated in the graph below. The graphs were created using the NCES Create-A- Graph site. A big thank-you to all who responded! I decided to run a Wordle query on this blog to get a sense for what I am really writing about. If you have never tried Wordle, the site defines Wordle as "a toy for generating “word clouds” from text that you provide. The clouds give greater prominence to words that appear more frequently in the source text." I feel it is much more than a toy. Imagine students running Wordle queries on blogs they follow to see the author's most written about topics? Or creating a Wordle from the text in their own essay to see what topics they cover in depth? Tom Barrett has a great slide show with many suggestions for using Wordle in the classroom. The Wordle from this blog is below. It provides me with useful information and reminds me that I should probably branch out a bit in my areas of discussion! Give Wordle a try for yourself! However, that email component is secondary to the main strengths of File Magic. This app allows you to easily move files, with both the iPhone/Touch app and the desktop app (Mac/Windows) open, from your desktop to your iPhone, or just via the iPhone app from iPhone to iPhone. These both work as long as both devices are on the same wireless network or accessing a WAP on the same network. You could just use the File Magic app on the iPhone/Touch as a data transfer-and-storage app if you wanted to. But, the File Magic app on the iPhone/Touch also allows you view several different file types, some of which are not native to the iPhone or iPod Touch. If you move a Word doc, a MS Powerpoint presentation, an Excel spreadsheet, or an Adobe PDF file to the iPhone/Touch, you can view it through the File Magic app on the device. Pretty sweet! http://www.splashdata.com/filemagic/ or in the App Store in iTunes. I have been noticing something more and more lately. When I chaperoned the recent 8th grade trip to New York City, I observed that students in every pair of seats were sharing a single set of earbuds attached to one music or DVD player; one student was using the left one and one was using the right. I wondered how it sounded, since one student was listening to the right channel and one to the left. Was one hearing just the melody and one hearing just the bass line? I also noticed this was not happening because every other student did not have some type of a device. Every student on the bus seemed to have a music player of some sort. I would never think of sharing music this way. I guess this has become a common practice because, first, many of the popular audio players do not have a speaker, so the use of a headphone is the only way to listen to the music, and, second, the dramatic rise in the use of the earbud style of headphone lends itself well to this practice. Interestingly enough, I noticed a few laptops at the local computer store that now have two audio-out jacks built-in. Well, at least if students are sharing a movie on this brand of computer, they will each have access to the full stereo experience via their own set of earbuds! Have you noticed any other "interesting" cultural practices lately due to technology advances? I receive lots of questions and see lots of posts about the effective use of Google Apps for Education in the K-12 environment. Following are some of my thoughts. We used a separate domain for the staff and students since staff mail had to be archived (as per the eDiscovery regulations) and student email does not. We purchased staff email archiving from Gaggle who have a Gmail API that makes it simple. We do not use Gaggle for email accounts, however. Google Apps for Education works the same way as Google Apps Premier, with a tad less online storage space per user. The wonderful things about it is that any user can limit any publication to just those who are on the domain, if they wish. We use this when we are publishing something for only district staff. In addition, users can always selectively choose outside users (like our students on the other domain) to see their Docs, Calendars, Sites, etc. When you administer Google Apps for Education, you can chose to allow access (or dis-allow access) to the suite of tools -- Email, Calendar, Docs, Talk, Sites, Video, and Web Pages -- for all users. Google Groups and Blogger are not in the suite, but, of course may be easily used. We received explicit permission from our parents in grades 6-8 to give their students email accounts. Here is the permission slip we used for this special purpose. If I were to set this up again, I might simply create three domains-- one for staff, one for the middle and high school students with email turned on, and one for the younger students with email turned off, but with log-in access to Docs and Sites, to allow collaborative work to take place in a closed environment. You do not need to have email turned on to use these tools. We used the last two digits of YOG-last name-first initial for the student accounts. In addition, so their real name did not show up in the header of mail they sent, when setting up the accounts, I used the YOG-last name for the last name of the student and their first initial for their first name. The use of these Google Apps has moved technology ahead rapidly in our district. Between shared calendars for school-based meetings to internal Google Sites acting as mini-Moodle packages, both teachers and students have made good use of the apps for communication, collaboration, and creation. Superintendent's Newsletter : this is coded to look like one of our Web pages, but is a Google Doc that the Superintendent's assistant updates each month. This is an easy way to distribute some of the updating of Web page info to others. She simply overwrites the content in the Google Doc each month and republishes, thus the hyperlink on the Web page remains the same. Google Goodies: this is a Google site with three parts-- a round-up of a weekly tip I sent to all staff and students, embedded screencasts for the basic Google Apps usage, and an RSS workshop I created for our adminstrators. Middle School Newsletter: although dated, this can give you some idea on how to distribute the work involved in your school-produced newsletter since each user can update their own pages of the shared Site. There is one thing different about Sites than Docs, though. When you make a change to a Google Sites page, it automatically goes live and with Docs you can choose to do it that same way or manually publish it when you are ready. We continue to use Google sites inside the domain for teacher/student sharing. Many teachers have begun to create resource pages for their students using Google docs. We make extensive use of the calendaring functionality in Google Apps for Ed for staff purposes. IEP meetings, vacation schedules, literacy meetings, couselors' student meetings, etc. are scheduled with invitations to staff on non-public calendars. With the addition of Google video, which provides internal-only storage and access to videos, we have been able to post some school-wide items that we would not have wanted outside. Students are beginning to use Google Sites as a personal portfolio, attaching their work to the file cabinet page and embedding those items that are embeddable. We are using Google Forms for all types of data collection-- everything from registering for workshops to survey data of parents and community members, and much more. We have changed the student naming convention to start with the entire 4 digits of the year of graduation. The administrative sort and search is easier that way. We have made use of the offline capabilities of Google Calendar in a school that was having Internet-connection problems. Although the calendars are static on the machine, at least they are accessible. I have spent quite a bit of time with Wolfram Alpha today. It is going to be interesting to introduce this to teachers and students. The user really needs to think about the appropriate time to choose this tool for information. I suggest you spend a bit of time on the examples page. As you click through the examples, there is a description of the type of search that can be conducted in the search box based on the topic you have chosen. This is a great way to help users to learn the most appropriate use of the tool and the proper syntax for searches. I have discovered a couple of really cool features about Wolfram Alpha. First, at least on the Mac side, in both Firefox and Safari, a student can simply drag any of the information boxes off of the WA site and the item winds up as a GIF on their computer desktop. It can easily be inserted in a project. (Even all the tables wind up being GIFS!) The student can then add the citation information needed for the GIF they are using. Secondly, all of the source information (both Web-based and print) consulted for that topic is included as a link at the bottom of the results page to both allow for further research and for determining the reliability and credibility of the results. I so love this!!! During the past month or so, I have realized people are beginning to use Twitter as their main form of communication. I am a regular Twitter user and follower, but do not keep it open on my desktop all day. I use it how it is intended to be used-- to post quick items of interest or respond with a short message to someone seeking help on a topic. And I think carefully before I answer, to determine whether the response is only useful for the questioner (and DM the answer) or if others might also benefit from the answer (and reply with the @questioner). I try not to clutter up the list with responses that are meaningless to most others. That is part of the Twetiquette (Twitter etiquette). I am starting to receive some of the reference questions I receive regularly from educators via Twitter. The direct messages from Twitter show up in my email inbox, and I then have to go open my Twitter client, locate the DM, and respond to the questioner. It is easy to ask a question in 140 characters, but not so easy to answer with anything meaningful in that number of characters. So, I wind up DM'ing three or four separate messages to the questioner, including having to shorten a URL or two in the Twitter messages. Twitter is not the place for that kind of communication, in my opinion. If you have a question that you want answered which you know will require me to search the Web and do some research, please don't send it via Twitter. I am always glad to help, but not always in 140-character bursts! I can (seemingly) find anything I want to on YouTube! I find myself searching YouTube for things that come up in general conversation the same way I do with the Internet Movie Database (IMDB). 1. Talking about the NCAA Final Four championship game with two colleagues. 2. Continued the discussion about the women's Final Four game tonight. 3. He had told me, if UConn men had made the Final Four, that Dale, the "blue and white" guy, was going to try to get back and forth between the women's and the men's games. 4. My colleagues and I then moved on to conversations about other famous "painted" people, most notably the Tin Man and Wicked Witch in the Wizard of Oz. 5. We discussed how scared we were when Margaret Hamilton would come out as the witch, and one colleague remembered watching an interview with her on Mr. Rogers. She remembered how kind and gentle Ms. Hamilton was during the interview, and how she tried to humanize the witch to make the character less scary for children. 6. One quick search, and I had the clip to show her. In the "old" days, I used to love the creative things Web page creators came up with on April 1st. The items were always clever and easily understood to be spoofs. However, with the changes in technology moving so fast in the last few years, I found myself, while doing real work on April 1, trying to decide if the information I was viewing was true or not! It was kinda scary that I could not tell. Are the spoofs getting better? Or is technology changing so fast that I will believe anything? However, people still continue to amaze me with their creativity on April 1. Here are a few of my favorites from the day. I receive monthly statistics about my personal Web site that gives me a lot of data. I can see that the most popular pages at http://kathyschrock.net/ are my blog, Kathy Schrock's Kaffeeklatsch, my Unofficial Guide to American Graffiti, and Rockwell Schrock's Boolean Machine, an interactive demonstration of Boolean search strategies usable on an interactive whiteboard. However, the statistic I also find interesting is the one that tells me which Web browsers the visitors are using who come to my site. This past month, Netscape 4 led the way with Firefox and IE6 not too far behind. Those three covered about 66% of the visitors. The surprise comes when I look at the bottom of the list. About 10% of the visitors to my site use browsers such as WebTV 1.x and WebTV 2.x, Netscape 2 and 3, Internet Explorer 2, 3, and 5, Safari 1, Firefox 0 and 1, and AOL 3 and 4. The users of these older Web browsers can probably get to my site, and navigate it, since it does not deploy the use of too many new technologies. I can just imagine the frustration these users feel when they try to visit some cool new sites or employ the use of some new Web 2.0 tools. Granted, their computers may not be able to handle the plug-ins or add-ons that some of these new technologies require, and they will continue to be frustrated until they can get a newer commputer. Some of your teachers may not realize there are updates available to their Internet browsers that will run on older machines. Or that there are some additional browsers, such as Avant and Opera, that may work for their particular situation. A short mention of something like this at a PD session or a faculty meeting could provide one of your teachers with the information he or she needs to be able to effectively use their older computer to navigate the Web sites of today. Photo courtesy of OiMax as per the Creative Commons licensing. Having been an avid Kindle user since it came out, I immediately upgraded to the Kindle 2 when it became available. It arrived today. There are plenty of unboxing videos and reviews already on the Web, so I am not going to do an in-depth review. I am just going to share some thoughts. - The new five way control button. It is slower than the previous scroll wheel for moving up and down within menus and books, but definitely useful for moving sideways in the browser, in some of the pop-up boxes, and for use with the updated highlighting feature which actually works like true highlighting! - The expanded support for conversion of personal document types including Microsoft Word, PDF, HTML, TXT, JPEG, GIF, PNG, BMP, PRC and MOBI documents is a welcome addition. - The text-to-speech option which is "interesting" to listen to. I found the female voice, slowed down one notch, was the most pleasant to listen to. I can see using this function while hooked into the aux jack in the car or on the deck after sunset in the summer. - The new experimental Web browser is great! It is more like a real browser in how it functions, and the 16 shades of gray make the images much, much clearer. Using the mobile versions of Facebook and Twitter, I was able to read and post, so my PLN is available to me while I am reading on the Kindle, too! - The note-taking feature is easier to get to and the new keyboard works just fine, although I liked the tilted keys on the thumb board of the previous version a bit better. There is also no @ key on the keyboard, and it takes an extra step to get to it on the symbol button. - The 3G network connection is speedy. And the page turns seem speedier. - The smaller buttons make it easier to hold without turning pages, especially since I do not use the leather cover and hold the coverless Kindle while reading, opting for a zippered Belkin case to keep the Kindle clean and protected. - There is still a "flash to black" as the electronic ink refreshes between pages. That's how electronic ink works, but after reading about 10 pages on a Kindle, you'll never notice that again. - Oh, by the way, the Kindle 2, as with the previous version, does a super job of letting you carry lots of books with you and easily reading them! The electronic ink is never tiring to my eyes and the ability to use the Kindle in bright sunlight and other natural light is great! Amazon releases the Kindle Reader for the iPhone and Touch! The free Kindle app for the iPhone/Touch works great! With adjustable type sizes and some navigation options, it allows non-Kindle users to purchase books (via their computer or the browser on the device) from the Kindle bookstore and download them to their iPhone/Touch. This works both over 3G and the 802.11x connections. For Kindle owners, it also does another cool thing-- it syncs your place in the book so, when you open the book on either device, it asks you if you want to move ahead to the place where you left off reading on the other device. There is no widescreen support for the Kindle app (yet! ), magazines and newspapers are not supported, you can add bookmarks, and you are able to read the notes you entered via your Kindle, but you cannot add new notes via the Kindle app. I would rather read an entire novel on the Kindle 2, but having the same books with me all the time for reference or relaxation is great! One commenter asked about the number of Audible recordings the Kindle 2 would hold if he had no books on the device. (The original Kindle had an SSD card slot, so you were only limited by the size of the SD card.) The answer to that question needs some explanation as to how Audible works. Audible offers its audiobook recordings in different quality formats. The Kindle 2 can play formats 2, 3, or 4, with format-4 being the best quality. According to these figures, each page of this print book takes up .13mb for format-2, .24mb for format-3, and .5mb for format-4. Does this hold true for all Audible recordings? I am not sure, but at least this gives the commenter some broad idea of how many Audible recordings would fit on the Kindle 2. I know that many of us attend and run conferences and professional development sessions, and with more educators getting netbooks, I wanted to share a problem that I experienced, and the solution, in case you are ever encounter it. I just purchased my fourth netbook, the MSI Wind, with b/g/n network ability and it worked like a dream on the wireless network at home (Apple Airport Express) and out and about at public WiFi hotspots. However, in my office, with the Apple Airport Extreme Base Station, the minute I connected to the wireless, the netbook would lock up my Airport Extreme. I thought I was imagining it the first couple of times and reset the base station and the cable router, only to have it happen each and every time. I did some Internet research and found the combination of the MSI Wind (and a few models of the Asus eeePC) and the Airport Extreme Base Station can cause a problem. However, I also found the solution below. It is an easy fix on the netbook. I only post this for those of you that might run into this either at a conference you are attending or running, or at a WiFi hotspot using the Airport Extreme base station. Hope it helps! A digital version of a blog post I made earlier this year and my (non-successful) ADE application video. Digital Pioneer: The Movie on Vimeo. A little known fact in Facebook is that you do not have to put your maiden name as part of your full profile name for others to find you by your "former" name. "There is a section for users to list their maiden name or alternate name. Please note that this name will not show up in your profile, and is only used to find you in search. To submit your alternate name, navigate to the Account Settings page, and click on "change" in the "Name" section. In the "Former Name" box, please be sure to include your full former name. You will now be found in search by your current name (as listed in your profile) and this alternate name." This would also be useful if you use some variant of your first name (i.e. Elizabeth vs. Beth), too. Adobe Acrobat Connect Pro is not free, and I have yet to find a no-cost option for schools that comes close to its capabilities. However, here are a few free options that provide more than just video-calling (like Skype and ooVoo). The sites listed below will allow you to experiment with a more full-featured toolset and, perhaps, provide enough justification in your school or district for the purchase of a full-fledged system! These are just brief overviews of the capabilities of each of these systems. Each system often adds new features, so take the time to give each of them a try and re-visit them regularly. ...the free version of Yugma requires registration by each of the (up to 20) attendees you host for a meeting. There is a download of Java required as well as a small client. The free version basically allows screen-sharing and chat. There is a Skype version of the client that utilizes the audio and chat within Skype as well. Photo located in a Creative Commons search in Flickr. Since I very rarely visit the official browser-based Twitter site, finding it better for my workflow to run a computer-based client called twhirl, I had forgotten about the search tools available on the official Twitter site. Twitter has a robust advanced search page which I recommend you try out. As you can see from the screenshot below, it is easy to limit or broaden your search by filling in multiple pieces of information. In addition to the advanced search page, Twitter also offers a handy list of operators you can use right from the simple search box to conduct a search. Once you conduct a search, you can easily choose to add the RSS feed for that search to your newsreader (Bloglines, Netvibes, Google Reader, etc.) to follow that person, topic, or even just be notified when a word that you are interested in is included in a tweet. Take some time to conduct complex searches using the Twitter advanced search page or conduct a search and aggregate it for "watching". At least you are guaranteed each entry is short and quick to read! I have been noticing a lot more of our students are bringing their personal laptops to school. (I have not seen any netbooks yet, though.) The main reasons seem to be both for taking notes in class and for moving files onto a flash drive in order to use one of the school's computers to print their homework. I began to think about allowing students onto the wireless network with their personal computers for both printing and for Internet access. In addition, they all have Google Apps for Education accounts and would be able to work in their online space. They would still be behind the content filter, so that would be covered. The only real problem I considered is that we would have to make it very clear to them why we only allow streaming at certain times of the day (lack of bandwidth). I posted a quick note on Twitter, asking my esteemed PLN about the process at their school or district. I received 16 answers in about ten minutes (hardly a scientific sample) but I really just wanted to get a feel for what others are doing. The interesting part was the anecdotal 140-character explanations. Here are a few. "Our district won't allow our teachers to connect laptops (purchased by the school) to connect to our network!" "No official policy on it but the practice is to let students/teachers/staff/student teachers/outside consultants on network." "We encourage, but do not yet require student laptops -- allow access to hot spots." "Not allowing interfaces at present but anticipate allowing wireless interface in near future." "We do, but there is a process in which they need to participate." "We officially let kids on with personal laptops if they have testing on file that indicates the need. Unofficially- we let all." "None of the 13 school districts allow any of their students OR teachers to hook their personal laptops to the school network." I envisioned just giving students the wireless access code to use, but then, after surfing right through the WAP and the content filter with my iPhone to any site I wanted to visit, I realized that not all devices would be allowed to be on the internal network and the WAP code would have to remain a secret. I will do some more testing, but the iPhone seemed to go directly through the filter for some sites that I know are filtered out by the Sonic Wall subscription.